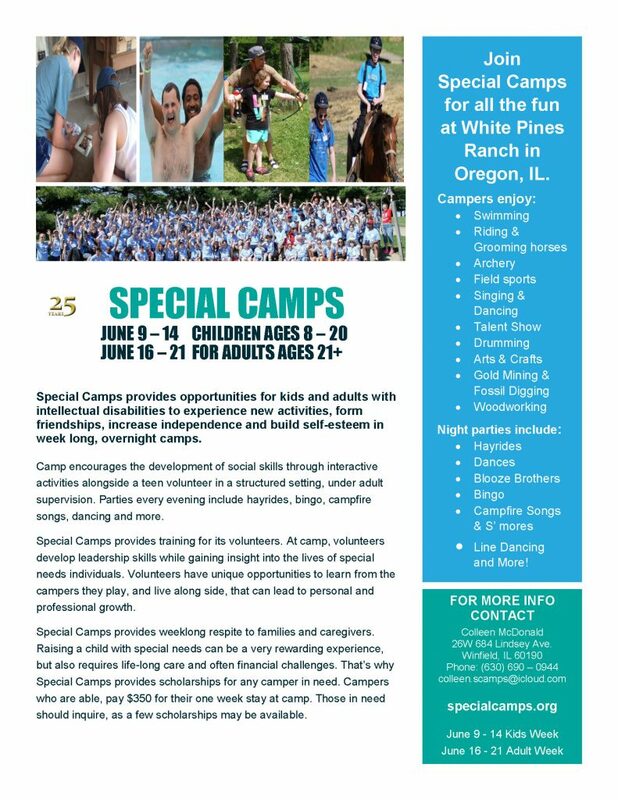 Special Camps provides opportunities for kids and adults with intellectual disabilities to experience new activities, form friendships, increase independence and build self-esteem in week long, overnight camps. Camp encourages the development of social skills through interactive activities alongside a teen volunteer in a structured setting, under adult supervision. Parties every evening include hayrides, bingo, campfire songs, dancing and more. Special Camps provides training for its volunteers. At camp, volunteers develop leadership skills while gaining insight into the lives of special needs individuals. Volunteers have unique opportunities to learn from the campers they play, and live along side, that can lead to personal and professional growth. Special Camps provides weeklong respite to families and caregivers. Raising a child with special needs can be a very rewarding experience, but also requires life-long care and often financial challenges. That’s why Special Camps provides scholarships for any camper in need. Campers who are able, pay $350 for their one week stay at camp. Those in need should inquire, as a few scholarships may be available.